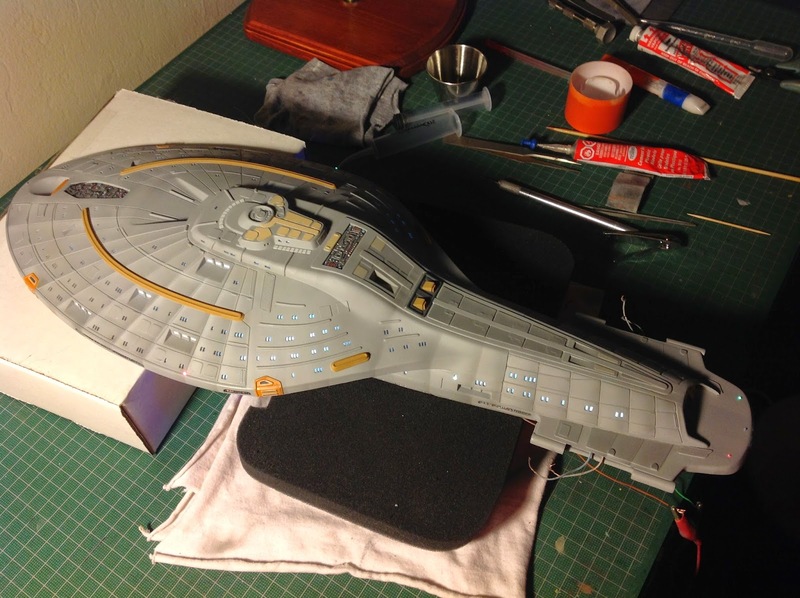 The scale modeling adventures and mishaps of Tony McCash. 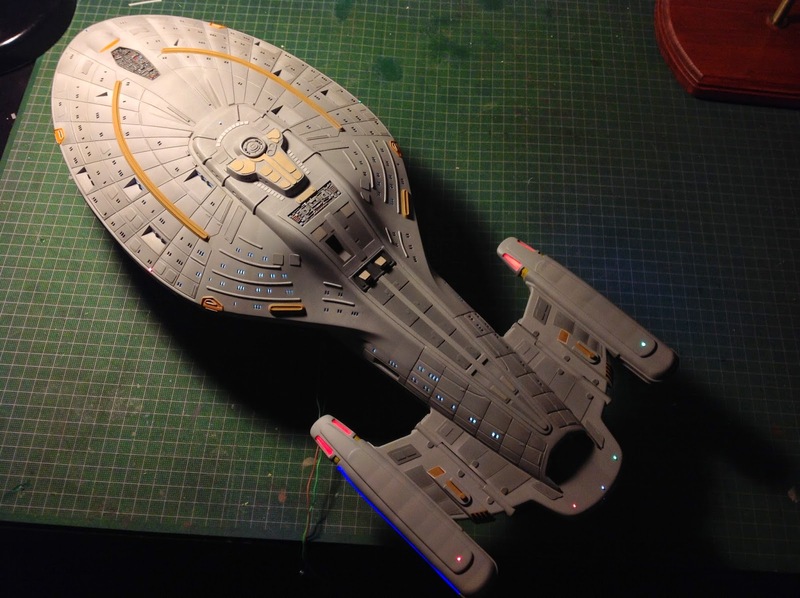 Here is my Revell U.S.S. Voyager Build. I didn't actually plan to document it on a blog, so the pictures are not a step by step guide. I have few pics of the electronics or the fiber optics being put in. I'm going to try to remember the problems and solutions that I had at each step, so that this can hopefully be of help to somebody building one for the first time. First thing to do was drill out all of those windows! I used a #68 (.787 mm) drill bit in a pin vice. Two holes per window, top and bottom. Then I went in with an exacto blade to cut the remaining plastic out from between the two holes. I cleaned up the hole with a flat micro file. This whole process took me a about a week of working on it for as long as I could stand it before taking a break. Be sure to clean up the back side as well. 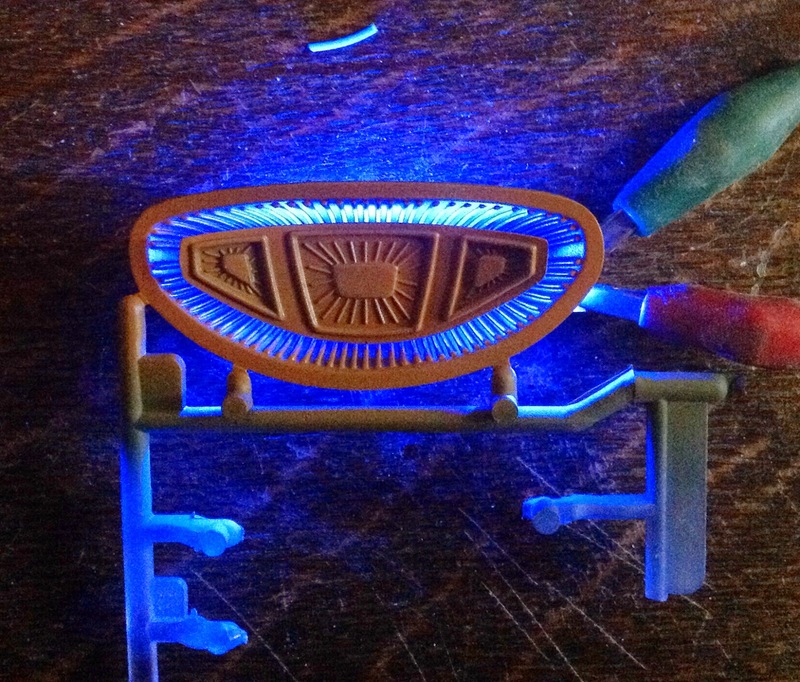 It was at this point that I thoroughly washed all the parts in dishwashing detergent to get the mold release off. 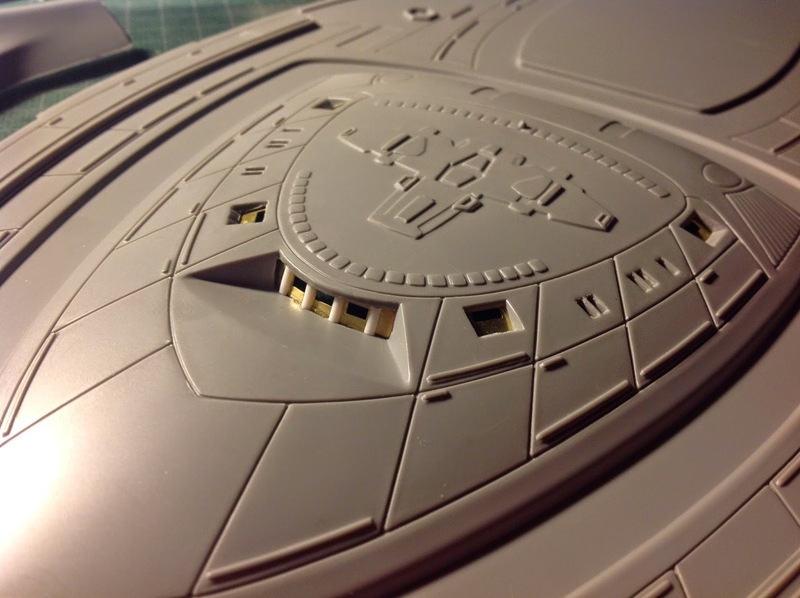 Before doing this, you will need to sand down the raised details on top of the bridge module. I used a large flat file to get it done quickly. The easiest way to apply these is to set them in place and then put a piece of masking tape over them. Peel up the tape with the parts stuck onto it, apply the glue and them lay it back down. 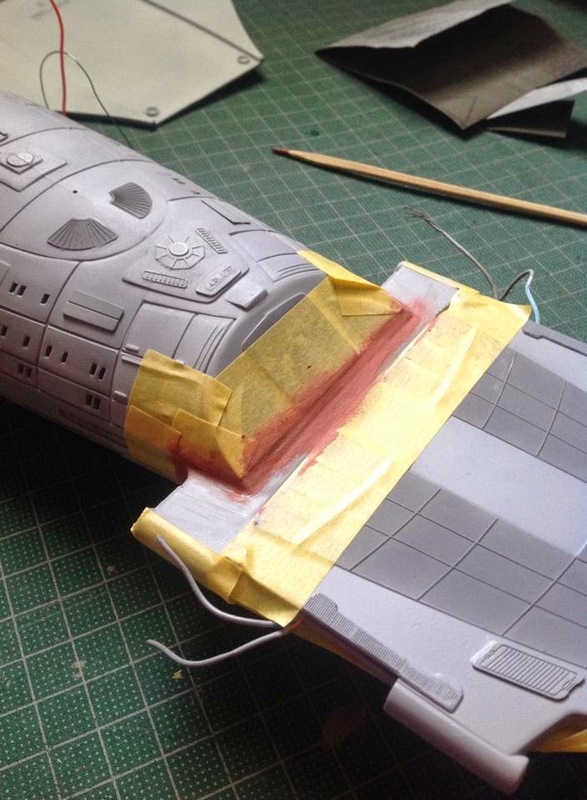 Once the glue is dry you can remove the masking tape. After getting all of the PE windows in place, I used 1/8" half round styrene strips to get the raised details on the window sills. 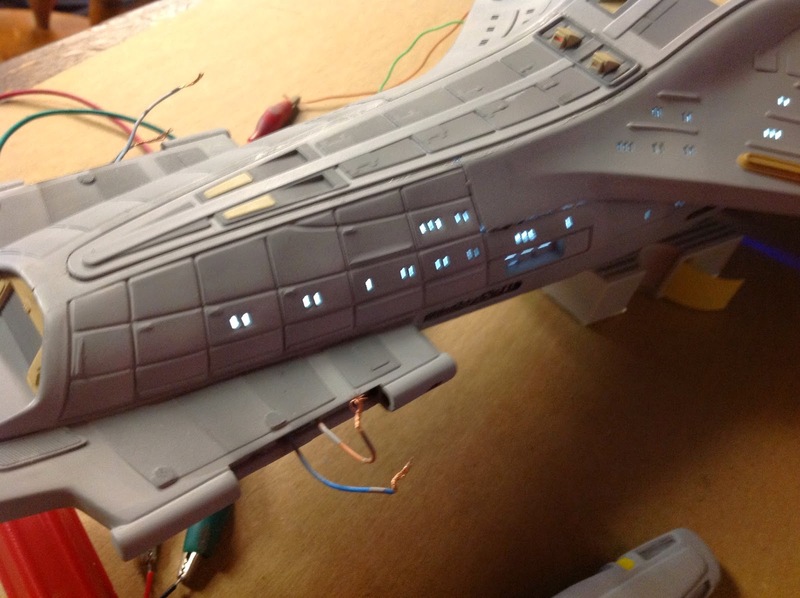 I also used the strips to add the missing details to the upper hull in front of the bridge module. I added 8 strips to the flat area around the bridge and various small pieces on the deck below that. I don't have pics of that specifically, but you can see it in the other pics. there are also a few windows missing behind and under the bridge that need to be drilled and shaped into rectangles. The PE kit comes with a template for them. I like to use Tamiya Fine Surface Primer. It's more expensive, but I think it is well worth the price. It is just the best primer I have ever used, plain and simple. It goes on smooth and dries fast. I get mine at my local hobby store for $10 a can. I used the regular gray instead of the light gray for this. 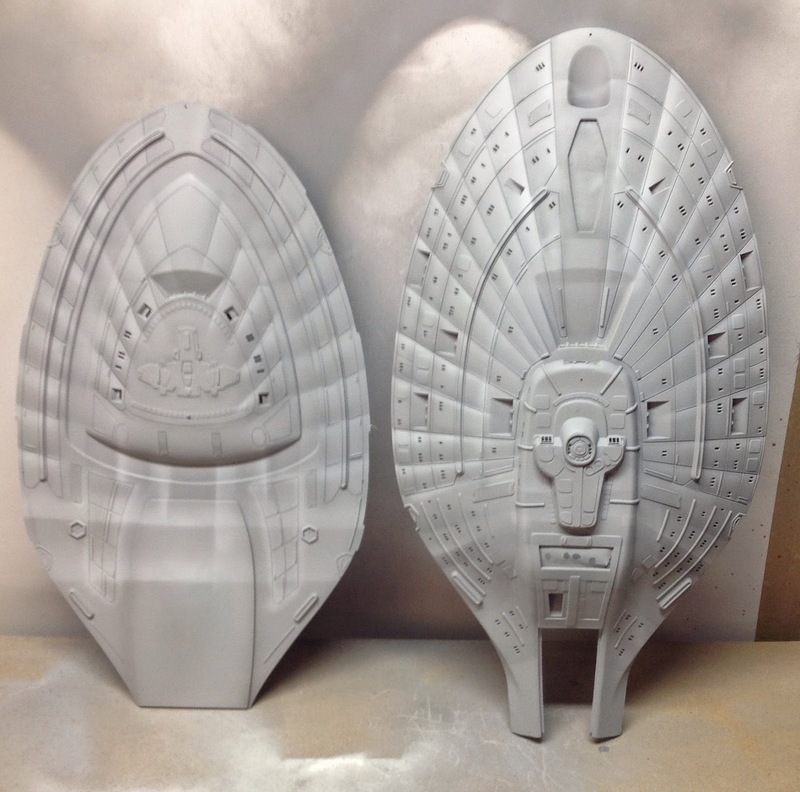 Once I got this all primed I realized that the primer color was very close to the color that Rick Sternbach (the designer of the ship) recommends for a screen accurate version of the ship (as opposed the a studio model color accurate version). The studio model is actually painted deckhouse blue. However, they toned the colors down in post production and the ship appears as a cool gray with a hint of blue on screen. I used the primer as the base color for the whole model. Sternbach on Trek BBS 9th post down. For the shading, I used Tamiya XF-54 Dark Sea Gray mixed with a little black. Using a piece of paper as a mask I set the paper on each grid line and lightly sprayed the edge of the paper, letting it bleed over to the model. This produces a feathered and shaded look forward of each grid line. I then went and applied the same technique behind every grid line using White paint. When I thought it was too much contrast I went back and lightly oversprayed some of the gray primer base color to tone it down. I realize that he studio model was not painted this way and it never looked like this on screen. But for me this is an artistic endeavor and I wanted to try the technique. Plus, I think it looks cool, so sue me. You may be wondering why the heck I pained it before glueing it together. This is a technique that I learned from watching Boyd Crompton of Trek Works. 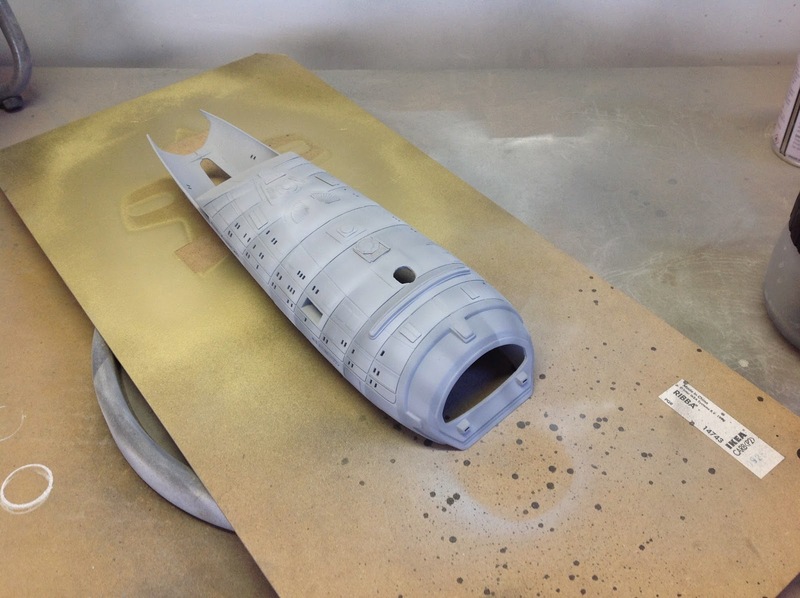 Foremost, painting it while in pieces makes it much easier to handle the model and get the airbrush at the correct angels without worrying about overspray on other finished parts of the model or breaking anything. Secondly (maybe more importantly, actually) is that you will not need to mask off all of those windows! This technique has one drawback; You have to be very careful handling the model during subsequent painting and construction or you will screw up you pretty paint job! 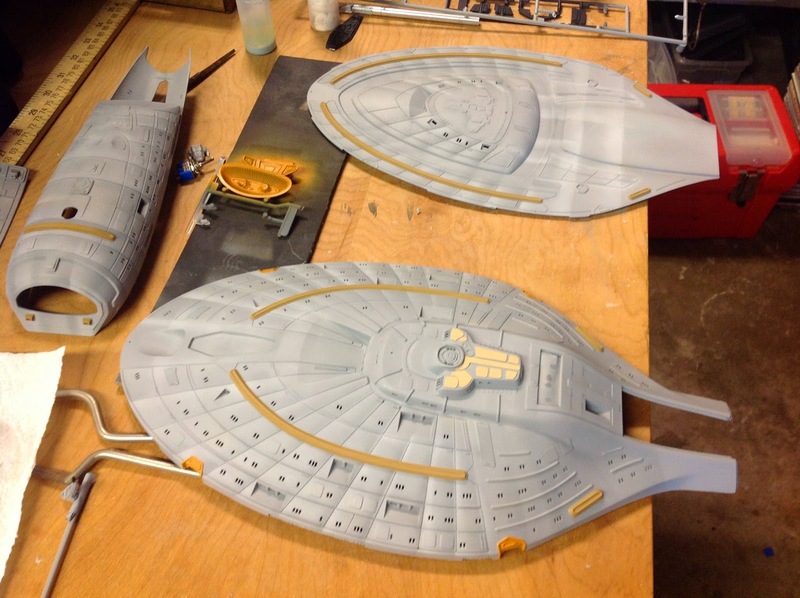 Once you have it all painted and glue it together, it is fairly easy to mask off the seams, putty and sand them, then repaint just that area. Be careful not to make a paint line where the new paint hits the edge of the masking tape. 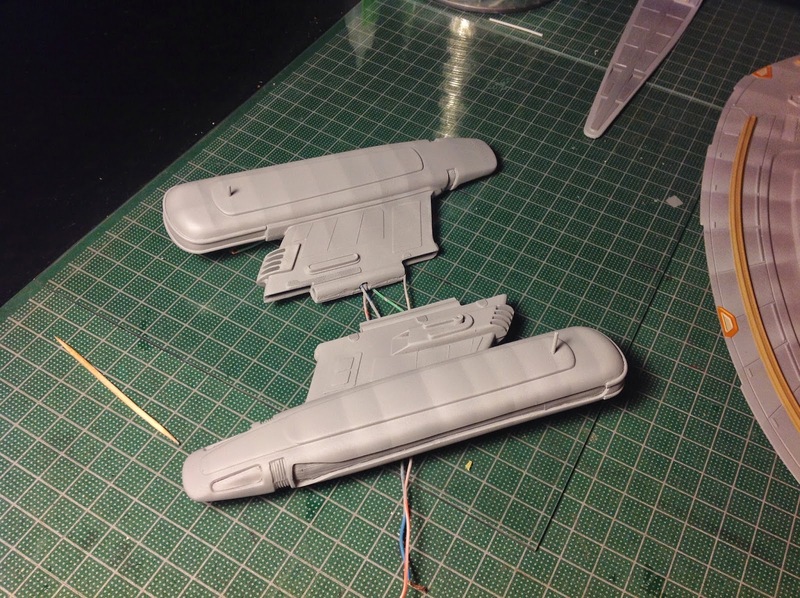 Next I masked off the Phaser strips and RCS Thrusters with Tamiya Masking Tape. 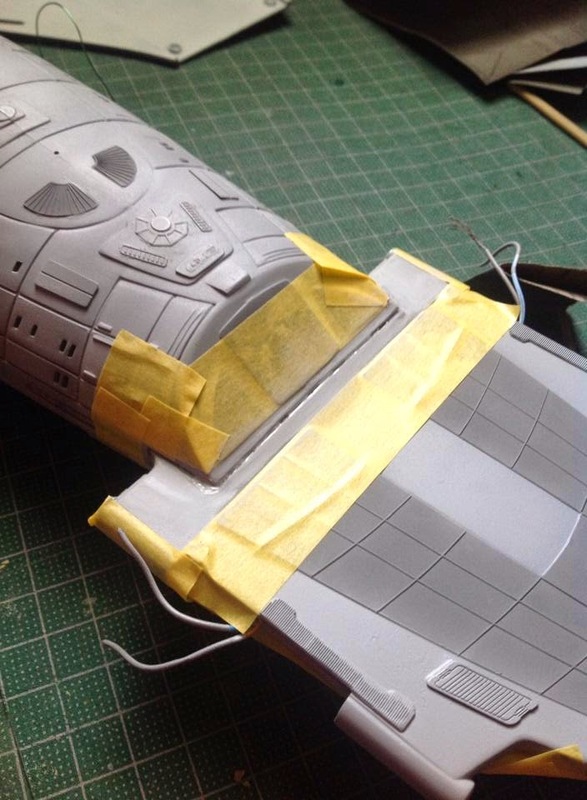 I have found Tamiya tape to be far superior to using blue painter's tape. I have never had Tamiya tape pull up any paint. 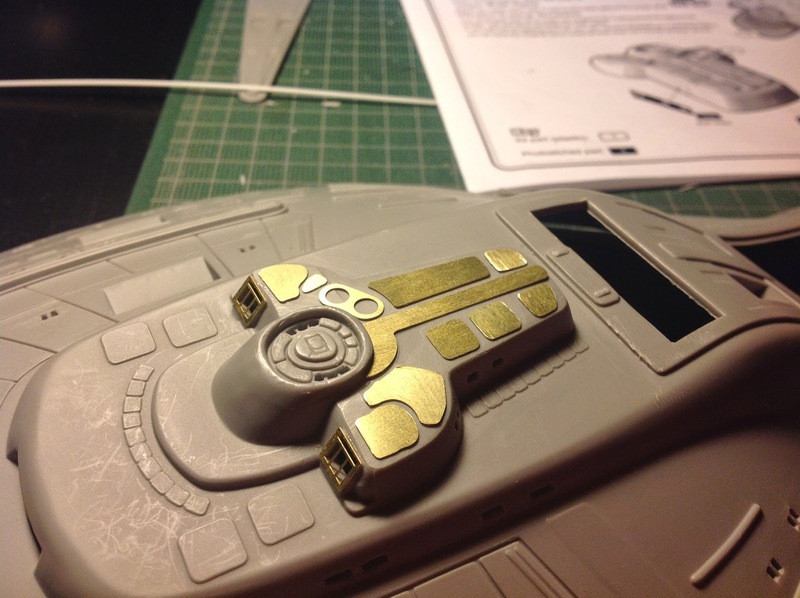 I painted the phaser strips Tamiya XF-59 Desert Yellow. 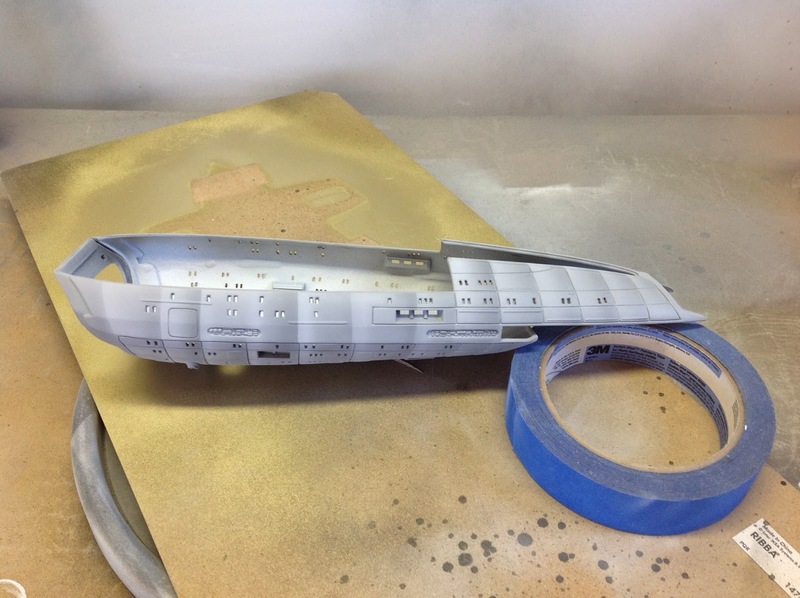 Once I was finished Painting, I glued .08" Styrene behind all of the windows. I did this instead of filling them with window maker or acrylic, because the windows on this model are not supposed to be flush with the hull; They are inset. 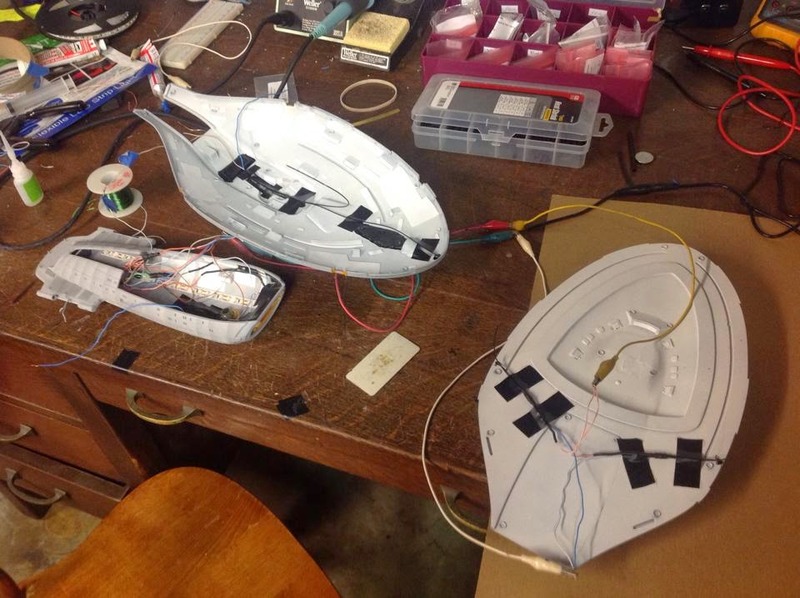 Also, the sensor strips on the sides of the saucer are the wrong shape on this model. They are squared of at the end, when they should be round. I did my best to round the edges out to make them more accurate. I'll be sure to get a shot of those in the finished pics. 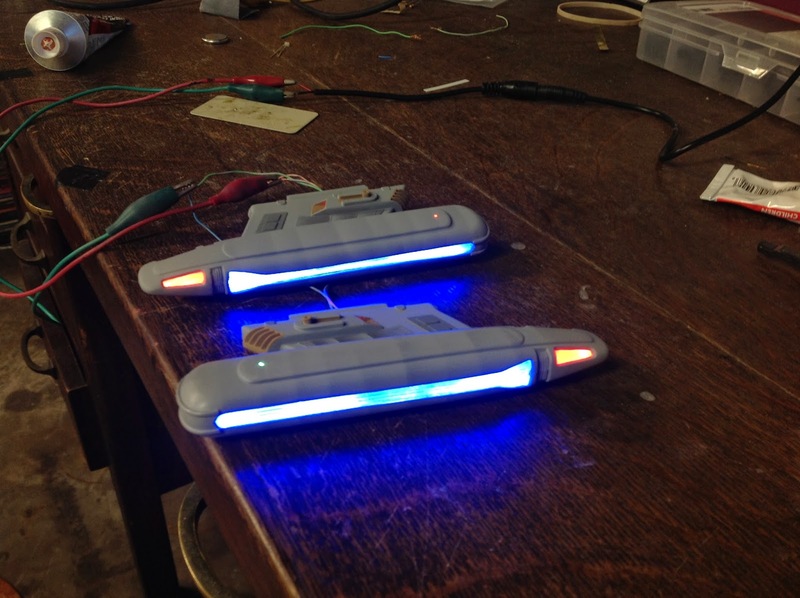 Next up were the warp nacelles and pylons, which I had previously assembled and installed the electronics into. Sorry, I didn't take any pics of that step. I glued half round styrene strips wrapping around the back of each engine for the missing details that are present on the studio model. I used blue LED tape for the grilles and red for the collectors. I separated and light blocked the red from the blue with a piece of spongy black foam. 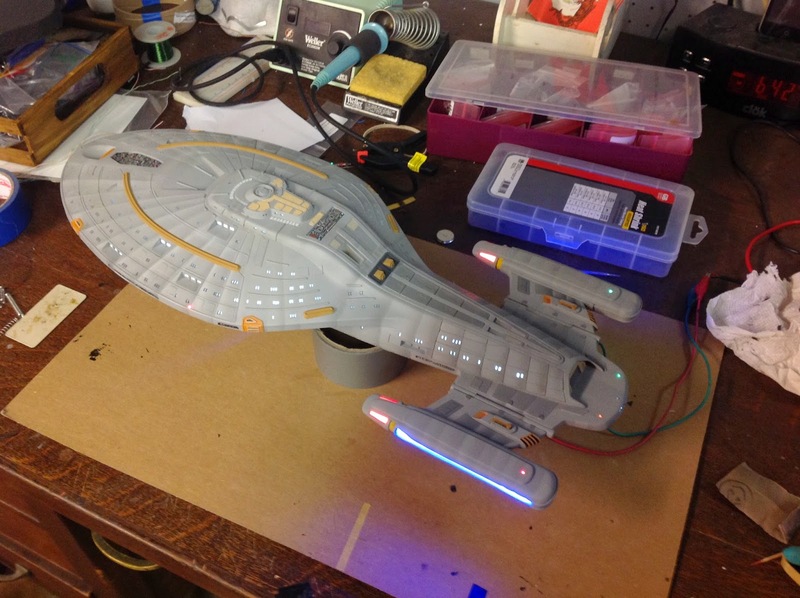 For the Nav Lights I used Red and Green 3mm LEDs with a 1mm fiber optic (Green for Starboard, Red for Port). I did not paint the collectors red or the grilles blue. 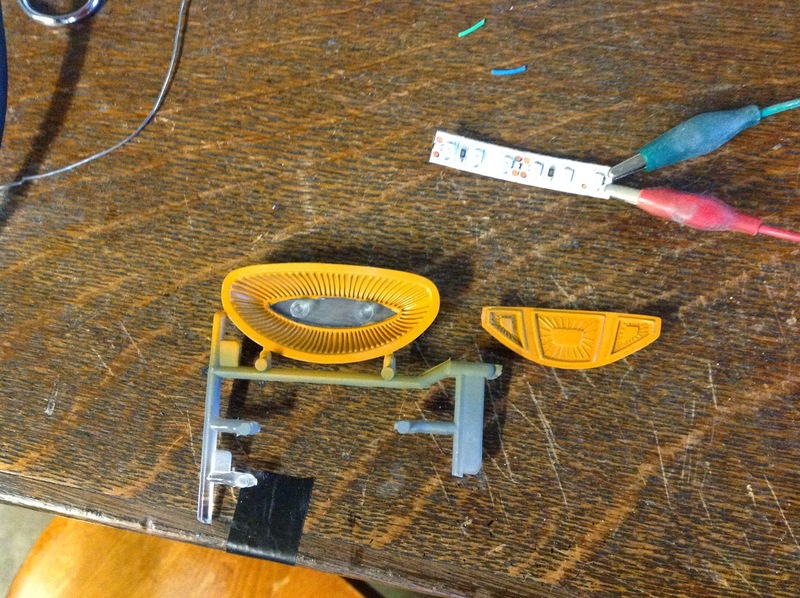 These parts were clear on the studio model, with the color only coming from the lighting. For the Main Deflector Dish I used the same combo of orange/desert yellow for this. It looks muddy in these pics, but it is a nice dark orange in person. I masked off the area where I wanted light to come through and painted both pieces orange. Most people leave this clear and paint it transparent blue. 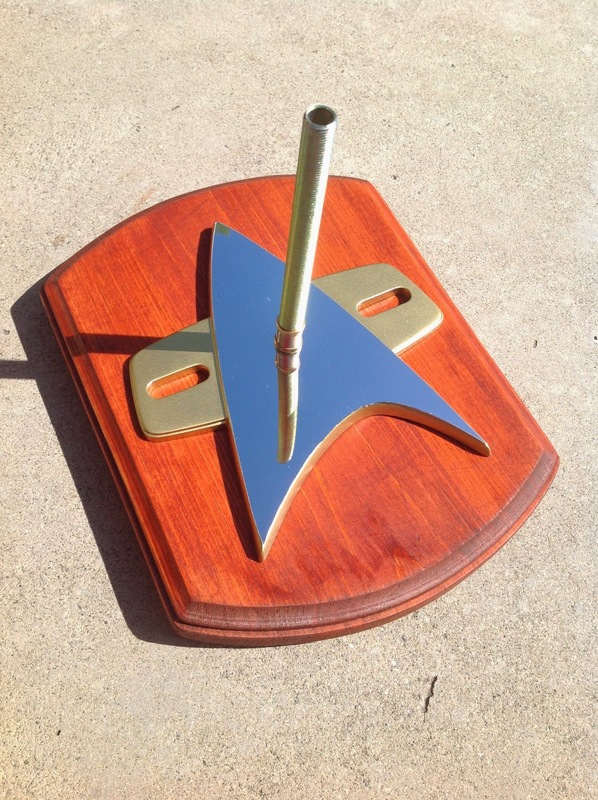 On the studio model it is orange and the blue comes from the light emitted from the hole behind the "dish". I wasn't sure if this would work, but it worked pretty well! 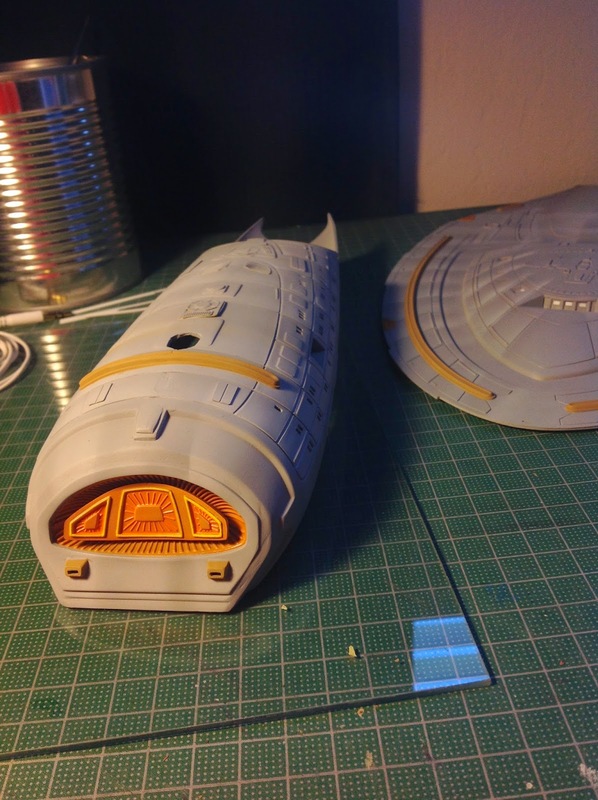 I painted the recessed areas a brighter orange, the raised lines yellow and glued it into the hull. The fantail was an extra fun piece of work (insert sarcasm here). 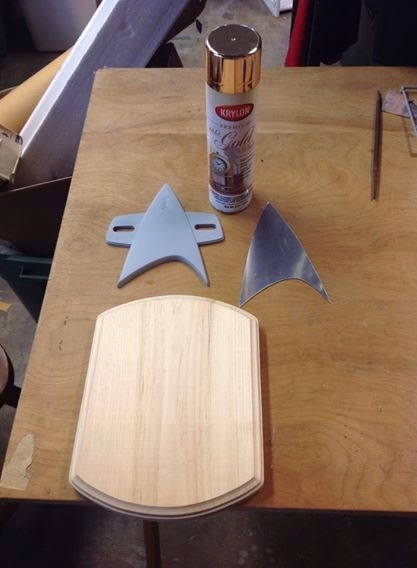 It has to be constructed before painting as you have to putty the seams and sand 'em down. Getting the LEDs in that small space with the Fiber Optics connected and running out the top and bottom was especially challenging. Getting the rear window to illuminate without the shadow of the fiber for the white flasher, or the white flashing light showing up through the windows was also a bit of a challenge. 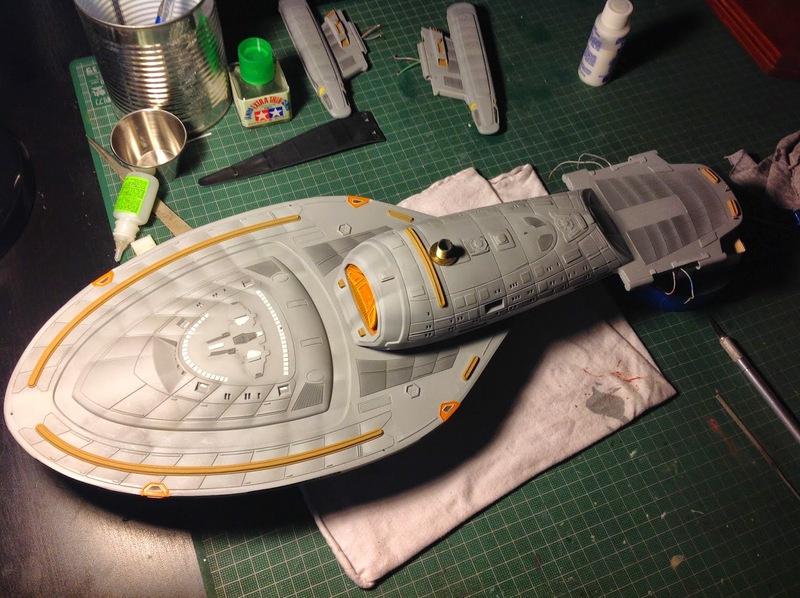 Once that fantail was all tidied up, I glued it into place on the secondary hull. 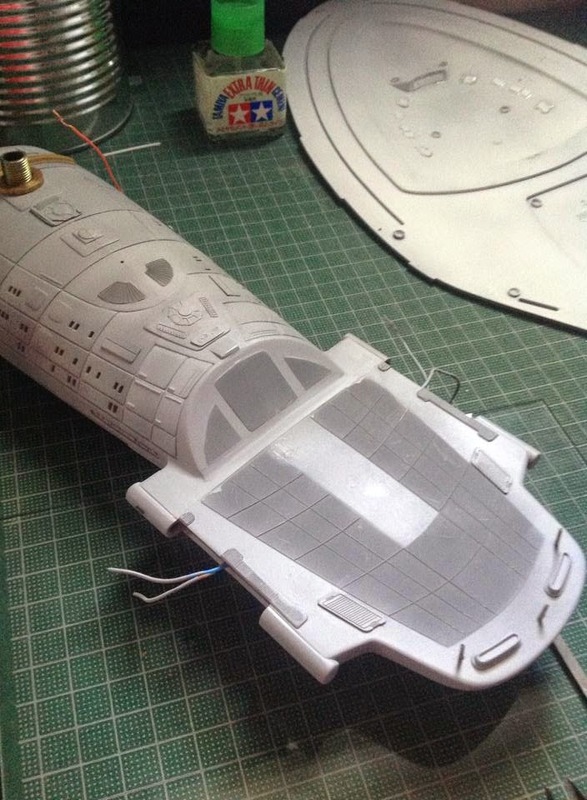 Make sure you build the interior of the shuttle bay first! I didn't plan on having the door open so I left it out only to later discover that that is what holds the back wall on! 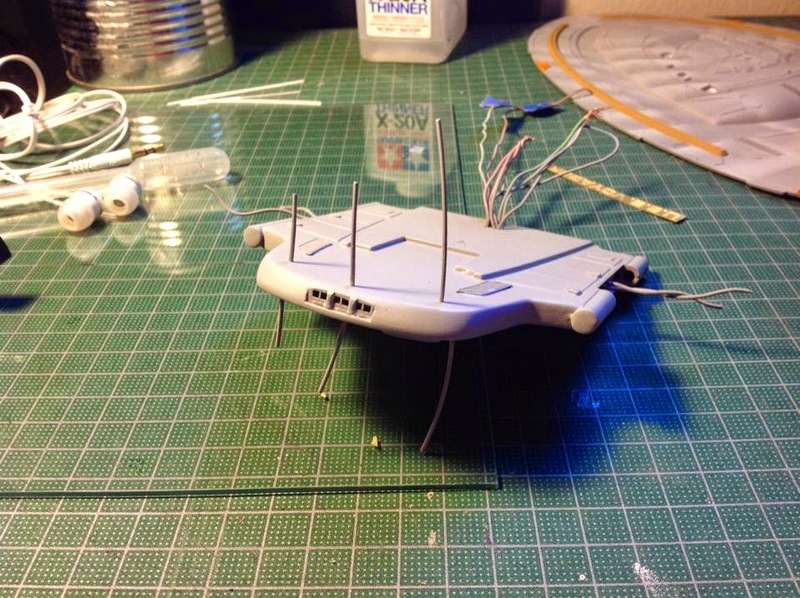 Connecting the saucer to the secondary hull was a special kind of difficult for some reason. I think that I needed to really sand down the areas where it joins some more before trying to glue them together. But I got it all together after all! Next up was getting the "Spine" wired up and into place. 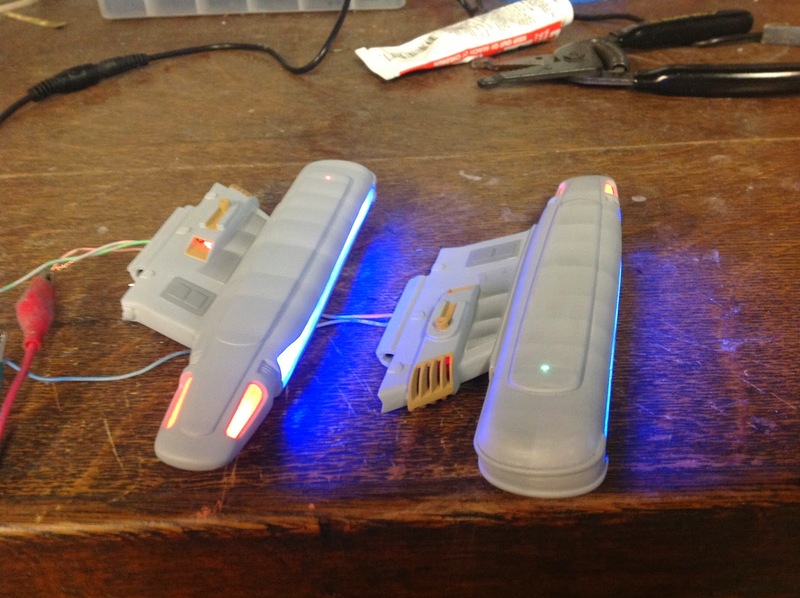 I glued two 3 mm red LEDs to the the back side to illuminate the photon torpedo launchers. I initially thought that this piece didn't fit well because it wasn't sitting flush but then I looked at the studio model and saw that there is supposed to be a lip all around the edge. I still had light leaks peaking through the seam, however. But that is what Tulip Paint is for! Squeeze this into the crack and then wipe with a damp cloth, let it dry and paint over it. Bam! No more light leaks. I learned this from Steve Neill. Then I finished up the shading on the underside of the fantail. Finally, I glued the engines into place. The next step will be a clear coat of Pledge. This provides a glossy, level surface for which to adhere the waterside decals. The only drawback is that you have to let it sit for two days before you can use decal solution on it. You have to let it sit for at least a week if you are going to do an enamel wash. This kit has a lot of tiny decals! But they really add to the detail and realism so I think that they are worth the effort. It took me two days to get them all on. next is to seal them in with another coat of Pledge. I'll let that cure for a few days and then hit it with some Testor's matte clear coat. Then it get mounted to the base and it's done. I really don't like the red stripes on this. Hopefully the dull coat tones it down. I was really unhappy with the decals. there was a lot of silvering and you could see the edges of the decals. However, another coat of Pledge and all of that disappeared! Now I need to let this cure for a few days and then I can put the final matte coat on. For the the base I used a shaped piece of wood from Jo-Ann Fabric and Crafts ($1.29), stained minwax gunstock. 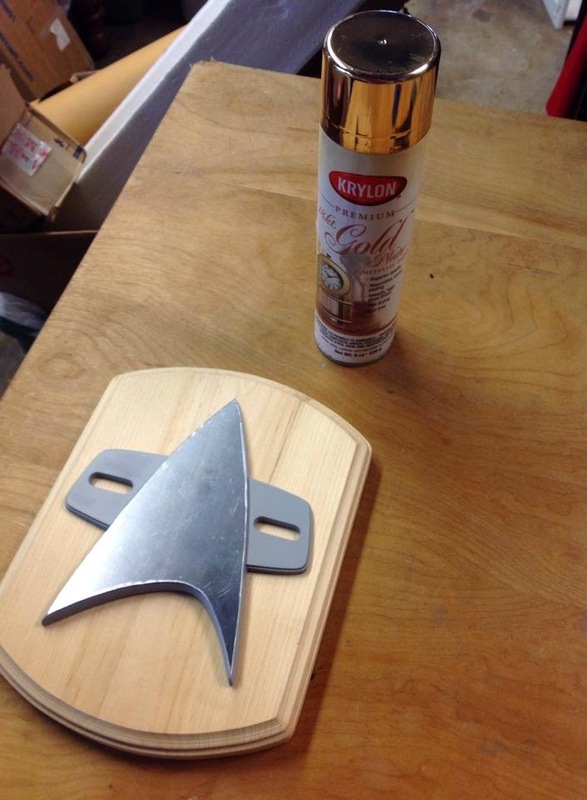 I used the Starfleet chevron base from the kit painted Gold with Krylon Premium Metallic Gold. I cut the shape of the chevron out of self adhesive Mirror Card and stuck it on top. This stuff scratches very easily, so don't take the protective coating off until you are finished! Finally, here she is all finished up! I made some mistakes and learned some things along the way as well. All in all it was a good, fun build and I am satisfied with the results. 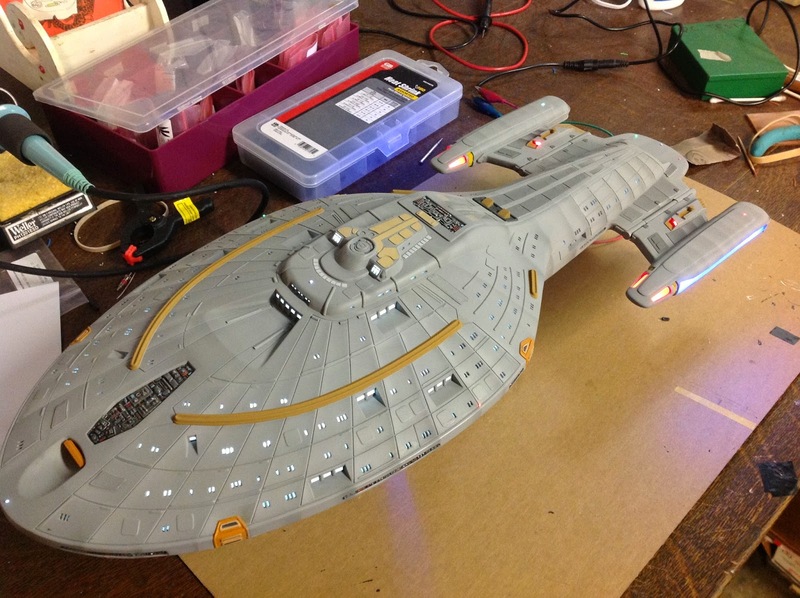 Superb work Tony, you are a fine modeler in your own right!! Thanks, Simon! That means a lot coming from you! If they only made these in the Scale Sizes I can handle. If it's smaller than 1/28 (Give or Take a Fraction) it's too small for me. Would like to get some more insight into exactly how you 'glued .08" Styrene behind all of the windows.'. I too think the windows should be inset and all the other builds I have read on seem to use a filler in the windows. Can you describe exactly how you went about covering the windows. Did you do one window at a time, what type of glue did you use, how were the results, would you do it this way again if you did another? Any insights you can give me are appreciated. I am gathering the materials to build one of my own and hope perhaps I can ask you questions from time to time on your process and thoughts. I just cut some small pieces from a flat sheet of styrene a little bigger than each bay of windows and glued it in with CA glue. I cut various sizes that would cover as many windows as possible. I also wanted the light diffusion of the white material instead of transparent windows. Yes, I would do it this way again for inset windows, it works well. The kit came with decals of silhouettes of crew members. I used a few of those on the back sides here and there so you can only see them when the windows are lit. It's subtle but looks cool. Ask me anything, i'm happy to help you out! Two quick questions, when you mention that you sanded the details off the bridge module top, I am assuming you didnt sand them completely flat/gone as as I look at the underside I would think this would result in holes since the plastic is dimpled from the underside to create the raised details. Out of curiosity, what volt power supply did you end up using? 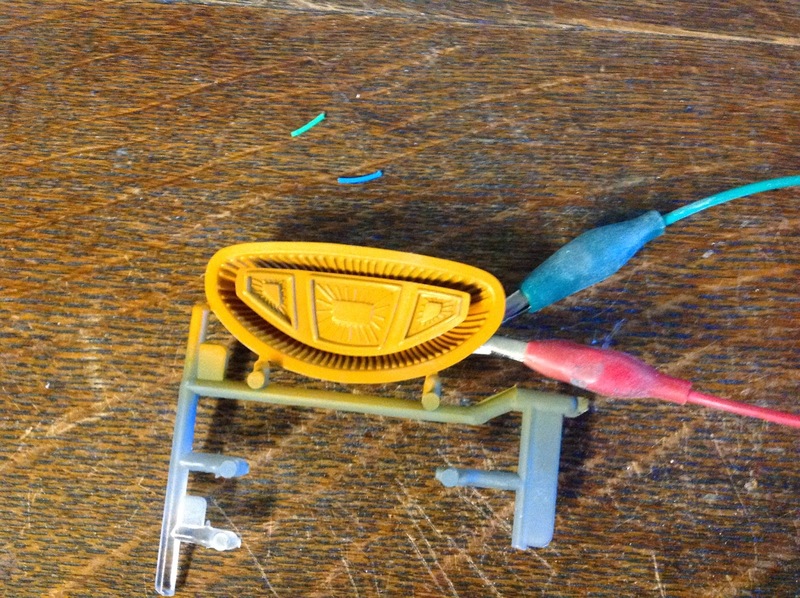 I am working out the wiring details and thinking on using 12 volts but was curious as to what you used. Is this the best place to ask my questions? Dont want to clutter up your board unless you feel these may help others. I sanded them all the way down and then used the photo etched details from Paragrafix. I don't recall if it resulted in any holes or not. But if it did I would have just used some putty to fix it. I used 9 volts. No particular reason, it's just what I had on hand. Yeah, questions here are fine or you can message me on Google+. My friend has got me interested in doing bigger model kits that you can put lighting in to. 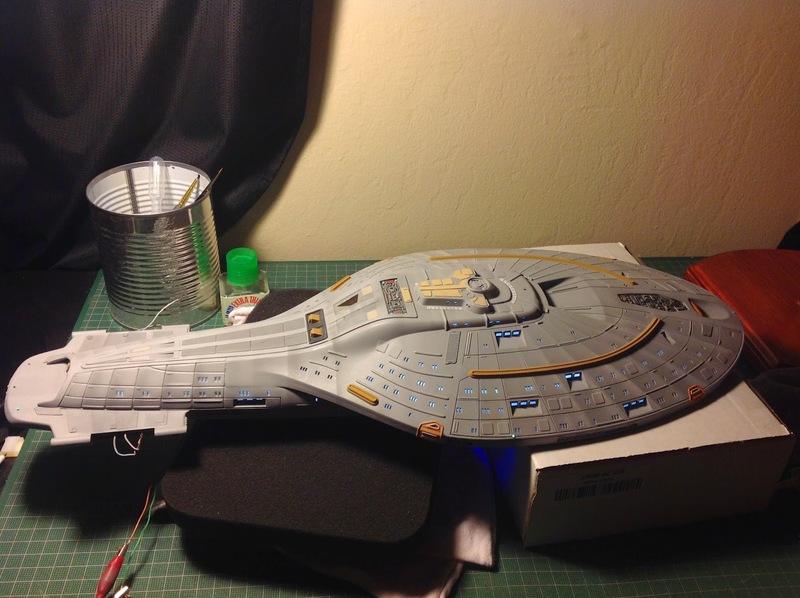 I think this would be a good model to start with at it is big enough on the inside to wire the lights and also to learn how to use decals and etching. Do you think this project would work if I was to leave out doing the small windows, and focus on the larger ones as a first time project? As much as I would love to get this beast accurate, id rather do something more within my skill level whilst still learning new skills. Also, how did you go about doing the lighting? 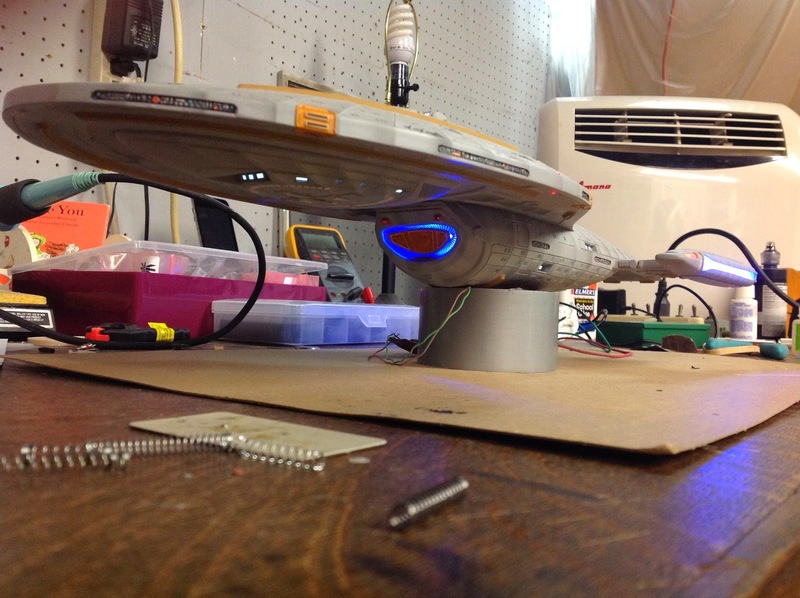 Was it all from scratch or did you use a kit? 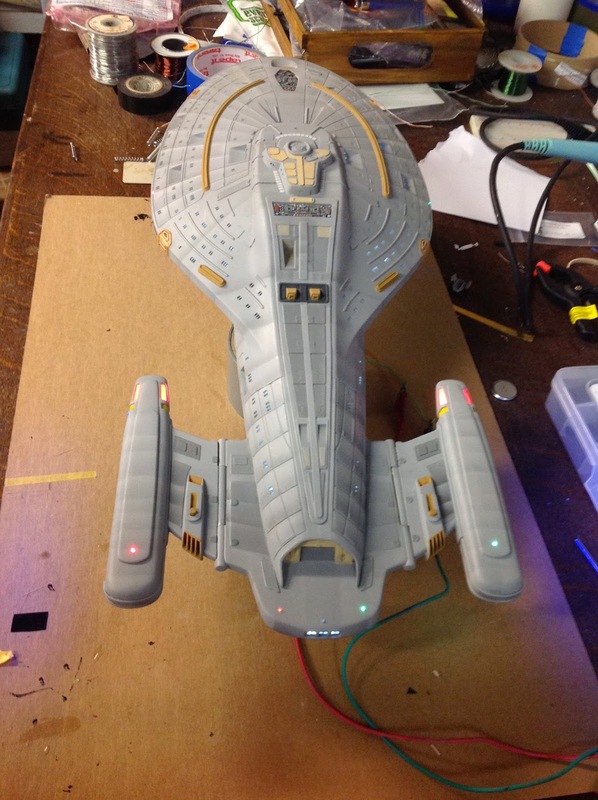 Again, I'd love to get it accurate, but if I am only going to focus on the bigger of the light sources it means i could probably buy the parts myself. Once I have completed the model, I want to go back to it once I have more model kits under my belt and do everything so it looks as good as this! I started on smaller kits that had round windows (and not so many!). 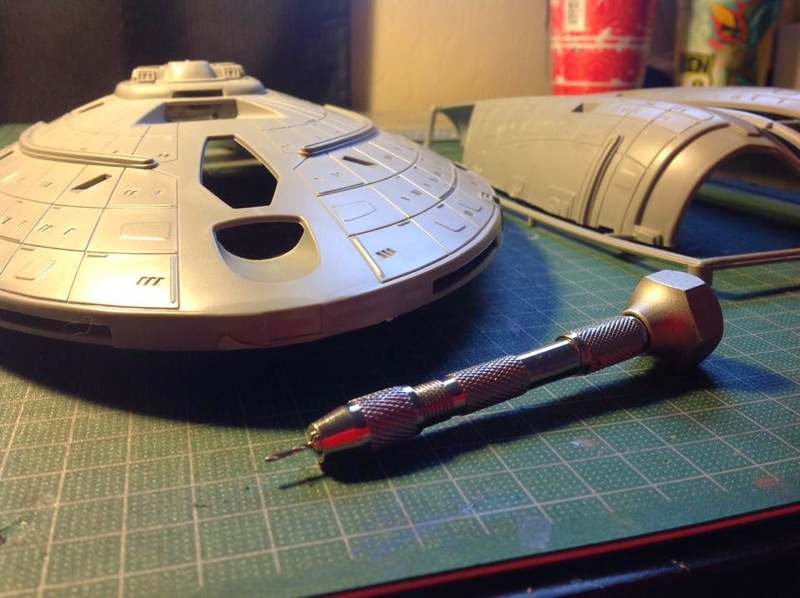 Just drilling round holes is a lot easier than trying to do the rectangular windows on those Star Trek Ships. You could probably get away with leaving the small windows dark and just lighting the bigger bay windows. 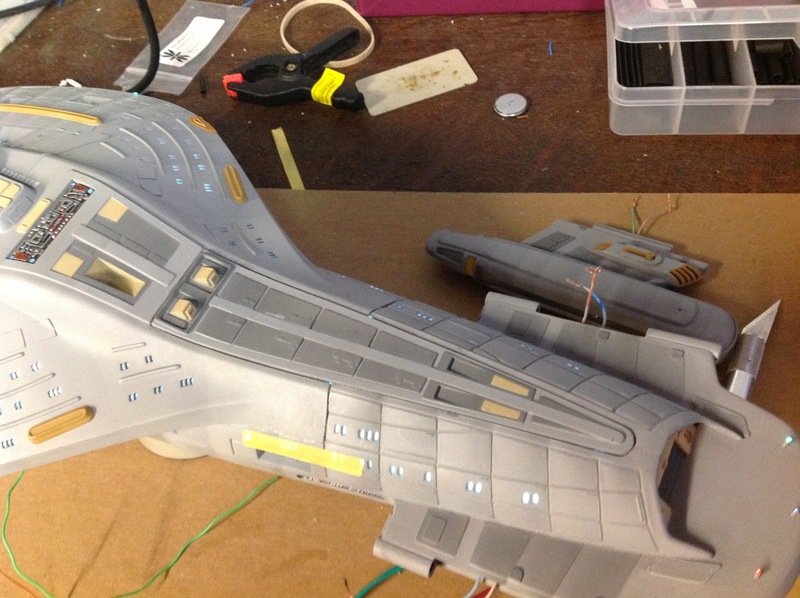 The hard part is the warp engines and trying to get wires into the thin fantail section. That was a real bear for me. 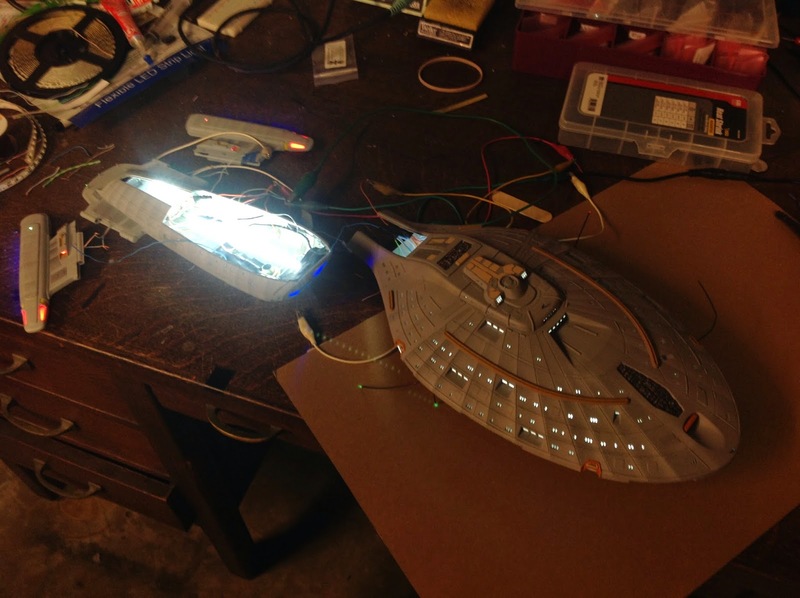 As far as lighting, I bet cheap LEDs form various online stores. You can find a few links on the right side of my blog. 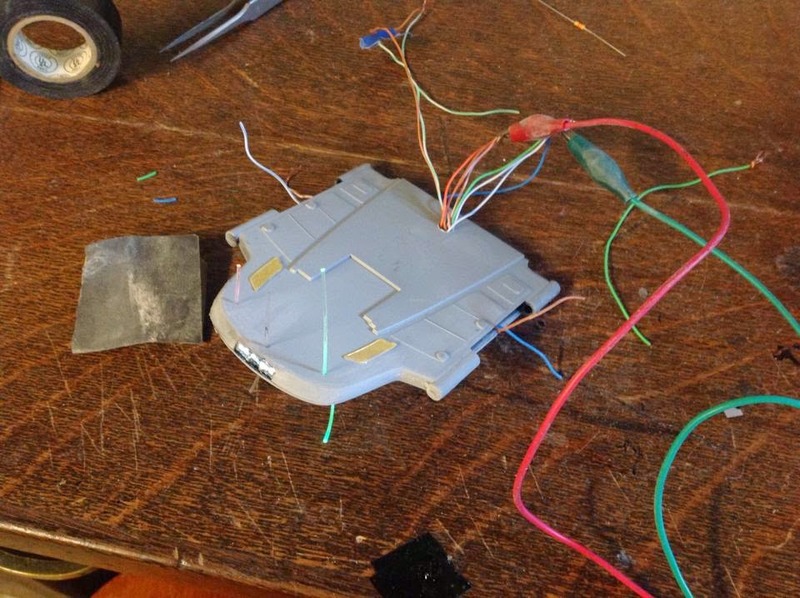 You will need some solder, wires, a soldering iron and a lot of patience. :) I didn't know much about electronics and resistors and LEDS and all that stuff but there is a lot of information on how to do it on youtube and such. You can buy Pre-wired kits from places like tenacontrols if you don't want the hassle. So as someone who is starting out, would you recommend any good kits? It doesn't need to be just Star Trek mind, although I do love all spaceships! I am mostly used to doing 28mm War Gaming Figures, so tidying up kits and drilling holes and such is nothing new to me. It's the painting with an airbrush and electronics I am excited about learning to work with! 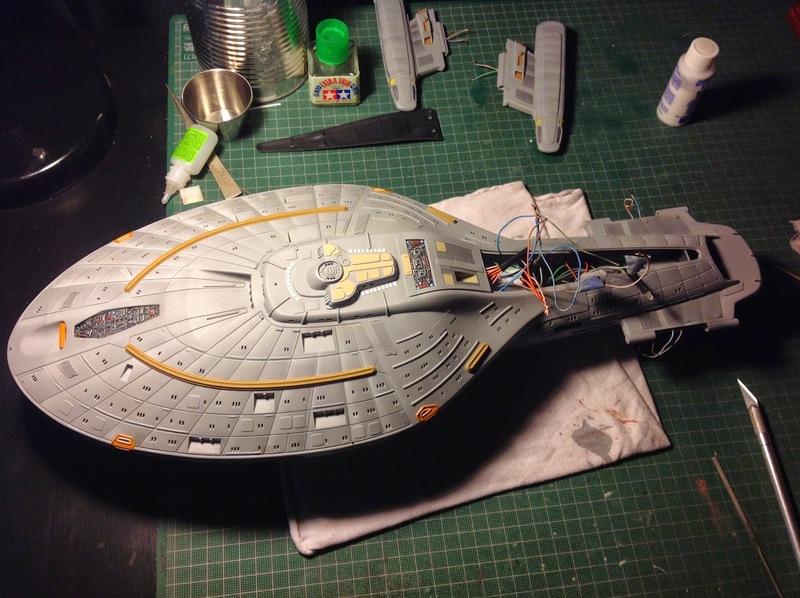 1/1000 scale USS Enterprise Refit (Kirk's movie ship) might be a good place to start. It's not too big and all of the windows are round on it. Battlestar Galactica (old or new) would be a good starter too. I buy cheap LEDs, not bet. LOL I can't go back and edit on this thing. 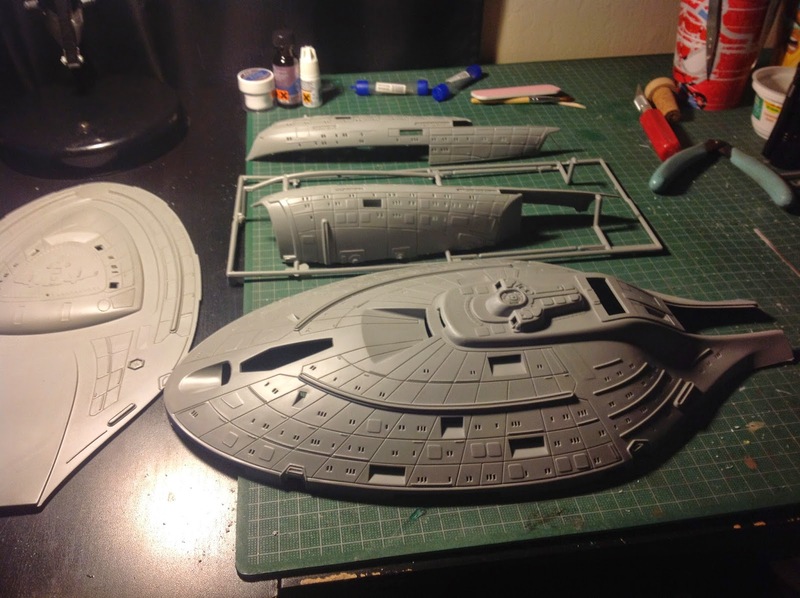 I bought the revell USS Enterprise NCC-1701, do you actually have to put all the parts together or does it depend on what kind of model you buy? this is the very first time I ever bought something like this, I suppose these revell models aren't that hard or annoying to build? 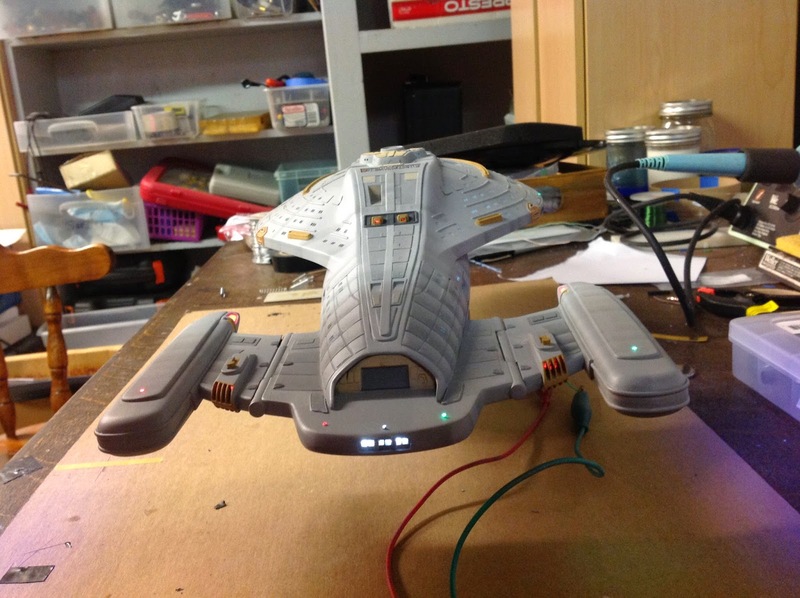 Hi Tony, this is one of the best Voyager models with lighting I've seen and am just wondering if you could make one of these models for me exactly as you've done so here? If so, please let me know how much it would cost? Thanks for the compliments, David. I don't build professionally it's just a hobby for me. To be honest, I'm not sure that I could reproduce those results. 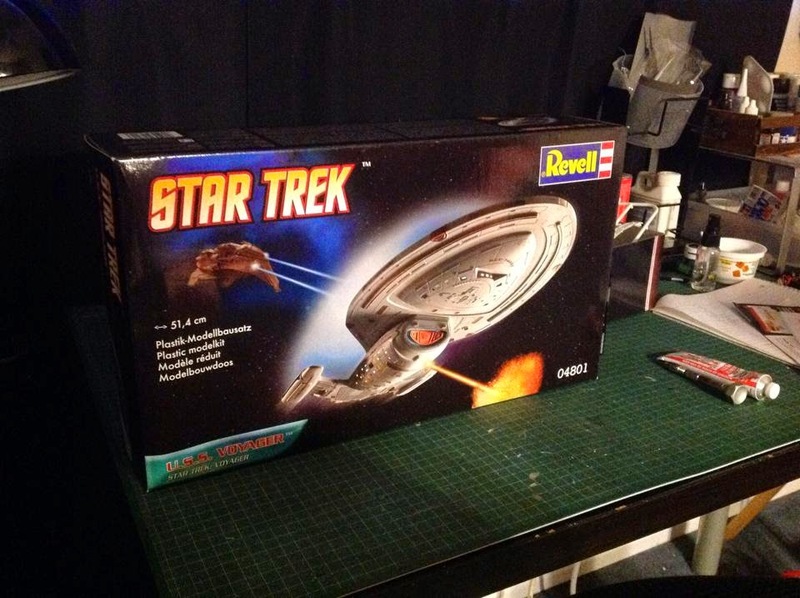 As far as cost for something like that the model itself is anywhere from $40 to $75 if on eBay. I estimate the supplies needed at around $150, conservatively. As for what to charge for the time to build it I would have no clue, sorry. My friend Simon Mercs builds very high end models, but it's not cheap and he has a backlog of two years. Boyd Crompton at Trekworks might be able to do it affordably for you. But I would encourage you to try it yourself. 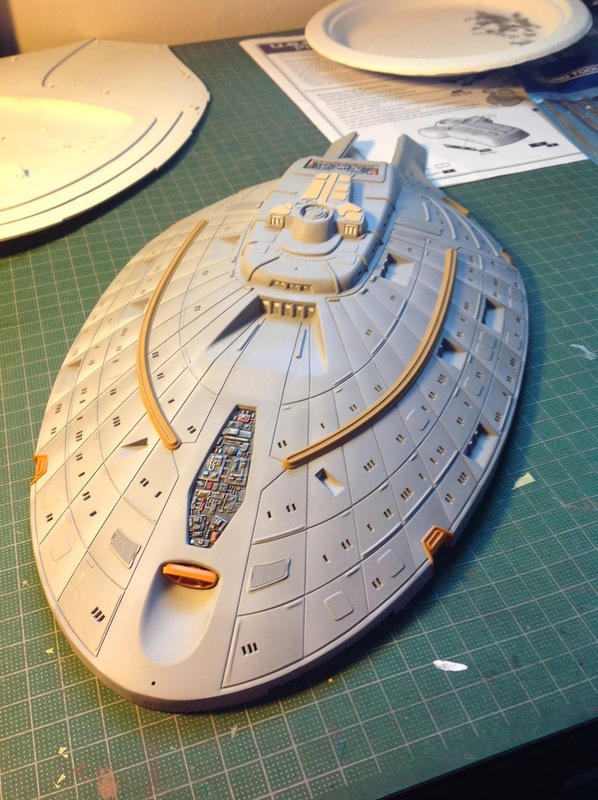 It takes some time and a lot of practice before tackling a big project like voyager, but It's worth the effort I think. In awe of this masterful work, I am deeply impressed to say the least! 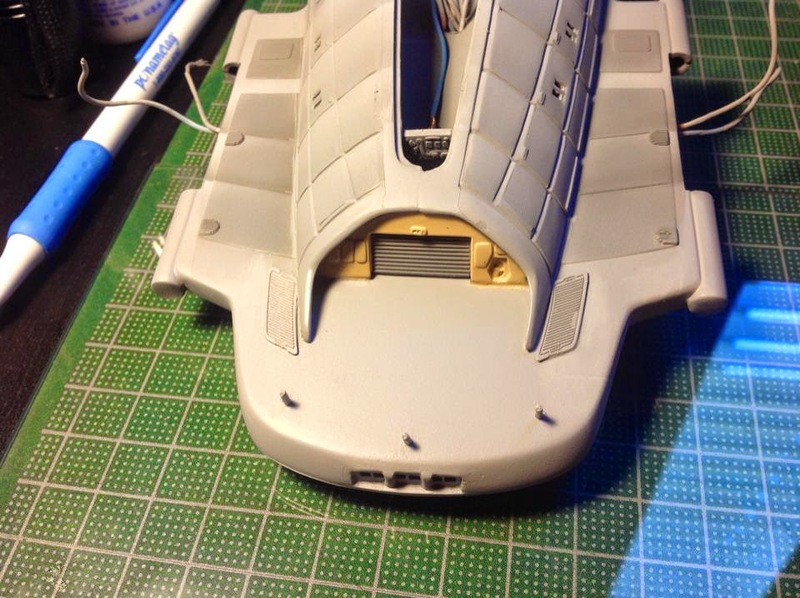 Am I correct that you used Tamiya Grey Part Number 87042 for the outer hull instead of the one you linked ? Ah, you are right I linked the white! Oops! Yes I used the light gray 87042.